Contracts to purchase previously owned U.S. homes unexpectedly fell in November, confirming earlier figures that showed the industry lost momentum toward the end of the year. The index of pending home sales dropped 0.9 percent after a revised 0.4 percent gain the prior month, figures from the National Association of Realtors showed Wednesday in Washington. The median forecast of 28 economists surveyed by Bloomberg called for an increase of 0.7 percent. 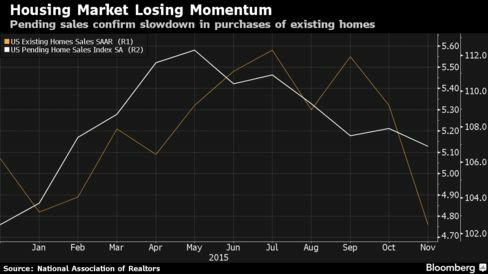 The pullback underscores concern raised by the slump in sales of existing homes last month, which the real-estate agents’ group argued was primarily caused by new mortgage-lending rules that delayed closings. Rising prices and a limited supply of properties on the market are also playing a role in holding back buyers, making for a slow recovery in housing. Estimates in the Bloomberg survey ranged from little change to a rise of 4 percent. The Realtors’ group previously reported an October gain of 0.2 percent. Two of four regions saw a decrease, the report showed. That included a 5.5 percent drop in the West and a 3 percent decline in the Northeast. Pending sales climbed 1.3 percent in the South and 1 percent in the Midwest. Compared with a year earlier, the index increased 5.1 percent on an unadjusted basis, after a 2.3 percent gain in the prior 12-month period. The pending sales gauge was 106.9 on a seasonally adjusted basis, the lowest since January. A reading of 100 corresponds to the average level of contract activity in 2001, or “historically healthy” home-buying traffic, according to the NAR. At the same time, conditions for sustained gains in home demand are in place. Hiring remains strong and mortgage costs are close to record low levels even after the Federal Reserve this month raised its benchmark interest rate for the first time in almost a decade. Real-estate agents continue to report “healthy levels of buyer interest” as mortgage rates remain low and hiring is “solid,” NAR’s Yun said in the statement. Economists consider pending sales a leading indicator because they track contract signings. Purchases of existing homes are tabulated when a deal closes, typically a month or two later. Home resales, which make up more than 90 percent of the housing market, slumped 10.5 percent in November to the lowest level since April of last year in part because a change in industry rules that lengthened the amount of time it took buyers to close on a deal, the Realtors’ group said on Dec. 22. Those changes should not have affected contract signings. The gap between the plunge in sales of previously owned houses and much smaller decline in pending purchases suggests that demand for existing homes could rebound in December, reflecting the unwinding of delays in closings, according to economists at Stone & McCarthy Research Associates in Princeton, New Jersey. “A catch-up in those closings points to at least a small rebound in existing home sales in December,” the economists said in a research note.